Yasmin Eleby Explains Why She Married Herself In 40th Birthday Wedding, Says No Regrets! 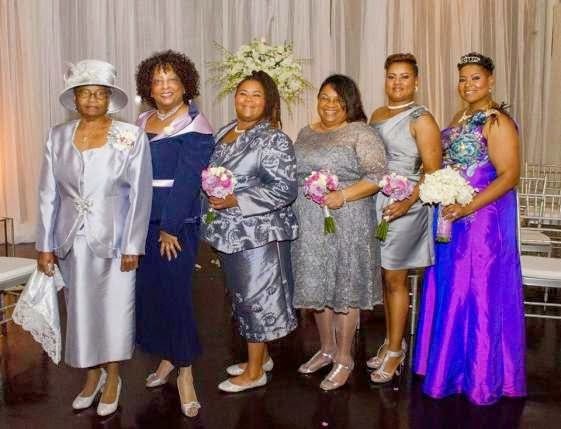 Yasmin Eleby married herself in a wedding ceremony celebrated on her 40th birthday as a promise to herself should she remain single at that age. RML posted the story here with best wishes to her, but a lot of people who read about the self-wedding bashed her for fooling herself, and wondered why her friends and family didn't stop her. Yasmin Eleby: For a few years leading up to my 40th birthday, I’d been joking that if I didn’t have a wedding by 40 that I would just have one myself without a groom. I thought having a wedding ceremony would be a unique way to celebrate my 40th with my family and my friends. And the closer that it got, I realized I had to put up or shut up. The Root: I’ve been reading the reactions to all the stories on you, and a common comment is, “Where were her friends? They didn’t stop her!” When you told your friends—like, “Hey, guys, I’m going to have a wedding and marry myself!”—what did they say? Yasmin Eleby: Some of them didn’t believe me. They thought I was joking, but once I explained to them what it would be about, they were supportive. The Root: When the invites for the ceremony went out to guests, what was their response? Yasmin Eleby: Not very many people knew it was a wedding. It was kind of a surprise. The invitations just said come celebrate my birthday in a unique way. I invited two of my exes. They were both happy for me. They were excited about it once they got there and realized what was happening. The Root: A lot of people have assumed that marrying yourself was an act of desperation. What exactly was the ceremony about for you? Yasmin Eleby: The ceremony is not about me being bitter for not having a man. It wasn’t like, “OK, I’m upset that I’m 40 and don’t have a man.” I wanted to show myself my self-love, my self-worth and my self-respect. It was always about me loving me. When God sends me my husband, he will come, but until then, I’m OK with it just being with me. The Root: What vows did you take during the ceremony? Yasmin Eleby: The first one was about forgiving myself. We’ve all made mistakes. I had to realize that if I ask for forgiveness, then it’s done. I don’t have to keep dwelling on the past. I can let it go. My second vow was to honor myself as a beautiful, fabulous being, conscious of making decisions for myself and to honor my self-worth. The third vow was love. I made a promise to love myself and to know that the more love I have for myself, the more love I have to share with others. The Root: This all sounds so sweet, but it’s been received in a much different light. What do you think of the reactions to your ceremony? Yasmin Eleby: It has been blown way out of proportion. From the few comments that I’ve read, they’re trying to paint me as crazy or bitter about not having a husband, and that is so not the case. I’m not bitter, I‘m not crazy. I’m just a fun-loving unique individual, and I just wanted to do something special and different. The Root: In hindsight, do you have any regrets about the ceremony?